This turned out to be a huge hit. Dante helped me, while Titus played video games (we love the Lego games for Xbox) with his cousin, and they all loved the food. Slice the zucchini with a mandoline or cheese sliced the long way, to make long slices. Make sure you have at least eight - I cut mine in half to cover most of the pasta sheet, width-wise. Spread the cream cheese on the lasagna sheets. Top with a slice of ham, one or two zucchini slices, a little sprinkling of corn and finally some parmesan. Roll up tightly and place seam-side down in an oven-proof dish. 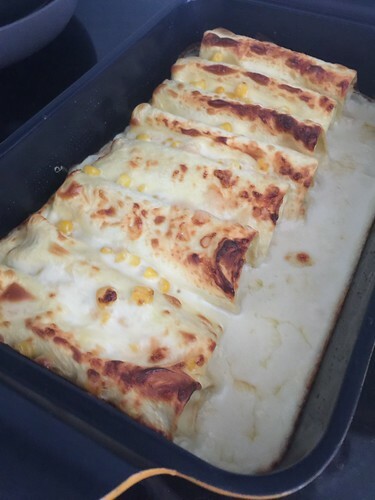 Cover with the cheese sauce and any remaining corn or cheese. Bake at 200°C for about 15-20 minutes until the pasta is soft and cooked through.